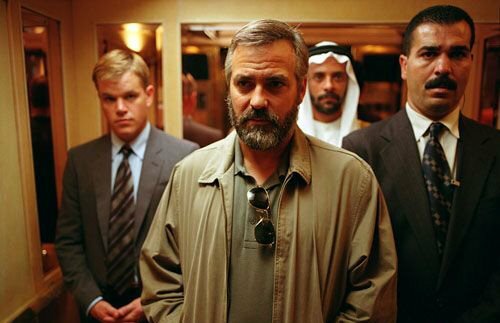 Following my post on SYRIANA writer/director Stephen Gaghan, I came across an interesting discussion on the necessity of rigorous structuring vs. a more liberal, visual approach to screenwriting. Jim Mercurio makes the following point about Gaghan's comments in the notorious CS podcast: "Gaghan's comments are showing that he is evolving from a screenwriter into a filmmaker. " What everybody seems to be missing in this discussion is that transitions play on a shot level, or at best on a scene level. Story structure goes way beyond that. Whatever Mercurio may think, a screenplay written solely from transitions will most likely end up in the same tiny niche market as KOYAANISQATSI. The same day I stumbled on the discussion above, I heard writer/director Michael Mann's commentary on the Restored Director's Cut of MANHUNTER. Mann's comments focus mainly on the parallel psychology of the serial murderer and the cop, besides a few killer anecdotes about production nightmares. My favourite: the airplane scene with the little girl freaking out over Will Graham's bloody crime scene photos. The only way to shoot this was to book the entire film crew on a United Airlines flight from Chicago to Orlando without informing the airline of their plans, keeping all equipment as hand luggage. Mid flight suddenly these hundred or so people got out of their seats and started filming. No need to say that Mann could kiss his United air miles goodbye. But let's skip to the last few minutes of the commentary in which Michael Mann summarises his approach to filmmaking. "Film is made in the editing room. In the writing and in the director's preparation you're planning what you're gonna do in the editing room." He then refers to the Russian theory of montage from the 1920's, which was followed by the Brits in the next decade (and used later to great commercial success by Alfred Hitchcock a.o.). I don't want to get too theoretical here, but anybody with a real interest in the effect of montage, should really do some reading on Lev Kuleshov and what is still known as the Kuleshov Effect. Using this, I could easily build a case to prove that transitions are structure. I'll spare you that one for now. But isn't it remarkable that seventy years apart, two Russians were telling the world about transitions in their respective art forms? To conclude: Mercurio is right when he says that Gaghan writes like a filmmaker. Like Michael Mann, he is already thinking of what he will do in the editing room and therefore writes his story from scene transitions rather than starting from an overall dramatic arc. This approach to script writing is indeed in many ways similar to that of Hitchcock or Mann but I am sure those last two went through far less drafts than Gaghan. BTW: Don't rush out to get Manhunter from HMV or Amazon.com: unfortunately Mann's commentary only features on a rare DVD which has been out of print for a while, which limits your options largely to eBay. But as a bonus from OZZYWOOD, you can download the last four minutes of Michael Mann's director's commentary here. Recently I watched BRUBAKER, not knowing anything about this 1980 drama directed by Stuart Rosenberg. If you haven't seen the film but are planning to do so in the near future, don't read on as I will spoil the pleasure (and surprise). The film strays from the traditional structure mainly because of its offbeat First Act. For the life of me, I could not detect an Inciting Incident, nor any significant protagonist characterisation. Instead we witness from Robert Redford's detainee character's POV how the most appalling injustice and brutality is inflicted relentlessly upon the inmates. Over thirty minutes into the movie, Redford's character identifies himself as the new warden and announces in the same scene that he wants to force through some serious reform. Finally we have our 1st Act Turning Point. I am still trying to understand why the warden's identity was kept hidden from the audience all along. Apart from a sudden surprise, it doesn't add a thing. The use of dramatic irony (i.e. : the audience knows, but the other characters don't) would have been much more powerful and it would have allowed for the badly needed character development. Leading US critic Roger Ebert wrote about this film: "There's no room for the spontaneity of real human personalities caught in real situations. That's especially annoying with the character of Brubaker himself, played well but within a frustratingly narrow range by Robert Redford. " Redford's performance is rock solid given the material. BRUBAKER's real problem is its flawed structure: half an hour into the movie, we have run out of screentime to sufficiently set up the protagonist's character and potential internal conflicts. Redford didn't have anything to work with, which makes Ebert's comment rather unfair. What the screenwriters did achieve quite well though, is the setup of antagonists and external obstacles in the way of the protagonist's objective. Perhaps this explains why the film did work for me. The first comment appearing after this one, will win a copy of Hitchcock's FRENZY, from The Hitchcock Collection. Although 'Kuleshov Effec't is well-known among modern filmmakers, I wonder how many today actually understand the underlying psychology and his original intent - that is, according to his own testament, Kuleshov used the experiment to indicate the usefulness and the impact of film editing on the human psyche. Interestingly, Kuleshov's experiment parallels psychologists' studies of the time, specifically the 'implied association' or 'association to ones own feelings'. In psychology today this is represented, and more commonly known as, the "Inkblot test". What should be of interest to filmmakers is that Rorschach's system of "perception and apperception" (the inkblot) emphasizes perceptual factors - for example, whether a response is influenced by form, perceived movement, or color of the blot. In filmmaking, this translates into influenced by frame composition, frame sequence or frame content. Tarkovski, Paradjanov, Vartanov and others of the early 20thC Soviet Film 'school', and Hitchcock later in the west, have all knowingly experimented with this and similar psychological systems. Hitchcock's 'Psycho' is the undeniable testament to Kuleshov's POV. Kuleshov's conclusion was that it is not the content of the images in a film which is important, but the execution of their combination, which is the point of my previous discussion. It is ironic that Michael Mann refers to Kuleshov's montage theory, when he actually seems to have missed the point completely, when stating that "Film is made in the editing room." The filmmaking starts way before then - On the page. The director 'breaths' visual and auditory 'life' into the script and the amalgamation is polished off in the editing room. Although he acknowledges the 1st two steps, he seems to be forgetting that great editing cannot 'save' an appalling story nor a dismally executed one - The 3 are absolutely interdependent, as the tension is inherent in the execution of their relationship (both story and frame-wise). My personal view therefore is, that the story structure and shot structure cannot be compared, as the later must address and reflect the prior. Also, a 'living' story will dictate its own rhythm and therefore, framework. At the same time, considering that the best perspective is only truly possible from a distance, the screenwriter and filmmaker in-one could never do as much justice to the potential story as when the two crafts are removed. Hence, I'm a great believer in keeping the specialists to their own craft ie. Writers (who are mid way between a novelist and a filmmaker) to develop the story, and filmmakers to interpret the story's implied movement and meaning through application of transition, juxtaposition and composition. As far as BRUBAKER is concerned, I have seen the film couple of times, around the time it came out and a few weeks ago. Both times I found it watch-able, but would never call it memorable. Interestingly, the first time it appealed more, maybe because since then we've all been conditioned to expect a faster pace(?). Reflecting on the recent viewing, the key elements don't seem to be balanced very well, as you note. I'm not necessarily criticizing the length of the 1st act, rather lack of depth to the protagonist's character. Although, to develop the Brubaker character, leaving the first act at the same length, would imply a much longer film. I guess he could have been more frugal and used his screen-time more effectively. Best screenplay?- maybe of a not-such-a-great lot!? And finally, yes I agree that "a screenplay written solely from transitions will most likely end up in the same tiny niche market as KOYAANISQATSI". Just remembered that the quote on the back of my business card says:- "The power of great vision begins with a great plan!" And, another thought: Was it Plato or Pythagoras (I'm confusing my "P's"), who said that meaning is only present in the context of polarities - There has to exist a duality/polarity/reflection (same yet opposite) for it is out of the tension between the opposites that meaning emerges. You can save the copy, as I have one, but I did want to coment on the blog. Excellent stuff and interesting perspectives. I am neither a screenwriter nor a buff of the cinematic arts, but recognize the basics and find substance for my own work in differing, distant expressions of the same subject, humanity. No debate from me on this one, but I will be back.